When Mitch Landrieu decided to bolster his national image by removing historic monuments, his actions sent New Orleans down a path of division, igniting racial and community tensions. After Mitch politicked around the country while doing nothing about the statue controversy after he spent $2 million removing them, newly inaugurated mayor LaToya Cantrell inherited the political hot potato. The group known as the Monument Relocation Committee proposed placing the Lee and Beauregard statues in Greenwood Cemetery and Davis at Beauvoir in Mississippi. While Davis will be out of state, his nearby home on the Gulf Coast is certainly an appropriate setting. These recommendations put the monuments back up on display. These are the best options if not returned to their historical perches. 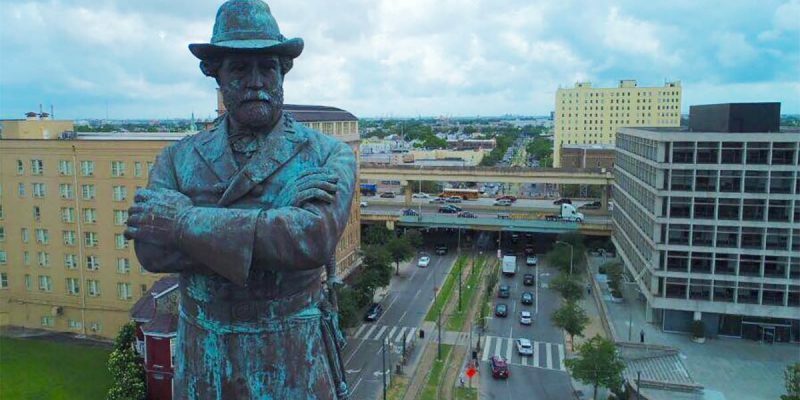 Although it might be an enjoyable, if spiteful, option to put Lee atop a 500-foot column in the neutral ground of Veterans in Metairie or along I10 just inside Jefferson Parish, allowing the General to look over New Orleans with disdain, we know this isn’t realistics. Neither, apparently, would be a force equipped to raid the Almonaster storage shed Landrieu stashed them in and take them back, then use cranes to place them back where they were to accomplish the restorations. LaToya Cantrell has yet to make her position on the Monument Relocation Committee known. She has been highly criticized on numerous issues, but so far Cantrell has shown herself willing to discuss options. Mitch Landrieu came through the city with a wrecking ball to placate and pander to the African American voter base and the white-guilt ridden Alt Left. Whereas Cantrell may be reasonable since she’s already “Woke” and not aspiring to be more accepted. In response to the committee’s recommendations, some monument supporters are calling for a city-wide vote as how to proceed with the confiscated statues, voting each monument individually. It is highly unlikely that a result more favorable to monument supporters would arise out of a vote. Petition drives have returned far fewer than the 10,000 signatures needed, and even with the monument wound still open, the more monument-friendly mayoral candidate Michael Bagneris did not even make the runoff. The thought that the electorate of Orleans Parish would vote in a majority to re-erect them is a dream. The best course is to take the dignity the new mayor is offering so the door isn’t open to even more sinister results regarding the fate of the raided public art and memorials. MacAoidh wrote a piece last year addressing that when people give up on a city and move to the suburbs, they are forfeiting their say—allowing the vultures to run the city uncontested. New Orleans expatriates traded their vote for superior quality of life elsewhere and the result is the altering of the Crescent City’s historical authenticity. Cantrell voted to tear them down, she has no obligation to take action on the monuments. This scenario, where the mayor is offering to consider input from stakeholders, is the best and only alternative. Monument supporters don’t have leverage. The courts ruled against the preservationists, legal ownership challenges have been rejected, City Park allowed Beauregard to be stolen, and Louisiana lawmakers—Republicans and Democrats—sat idly and let the removals happen. The city has the monuments in its possession. The new mayor set the guidelines as to what she is willing to compromise on, meaning no talks on the Battle of Liberty Place and no restoration to original sites. The century old historic landmarks never should have been touched—including Liberty Place. But they were, and nothing can be done to change what happened. The removals were planned to be permanent, Mitch never wanted them out in the public again or his crusade would look like a failure, like the political stunt it was. Upon Landrieu leaving office, his successor immediately explored options to get them out of that storage shed, albeit on her terms. The generals should be publicly displayed in highly visible areas. Prominent locations in Greenwood Cemetery, on private property, would be the best attainable option.